Topics: Instructional Classes, Bronze Sculpture Gallery, Awards, and Custom Design Taxidermy. It is hosted by Yahoo Inc (California, Sunnyvale,) using YTS/1 web server. There are 4 DNS records, such as yns2.yahoo.com, ns8.san.yahoo.com, and ns9.san.yahoo.com. 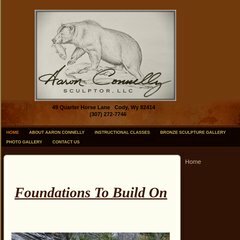 Aaronconnellysculptor.com's server IP number is 98.136.92.79.